Considering the adverse weather conditions there was a large attendance at the Dollar Mechanics Friday, Nov. 23rd, when the concert and unveiling of the Roll of Honor Board was performed. The proceedings commenced with the singing of " God save the King" which was followed by a nicely played overture by Miss Agnes Gaw. The unveiling ceremony of the Honor Board, which was to have been performed by the Hon. Thos. Livingstone who was unavoidably drained, fell to Mr Wallace. In referring to the object he said the names on the Board would be there in honor of those who had offered their service for their King and Country. The coming generation would ask -What are the names on the Board for? and they would be told that they were the names of men of Dollar who took part in the great war. He did not think there were any cowards in Dollar, or not many. 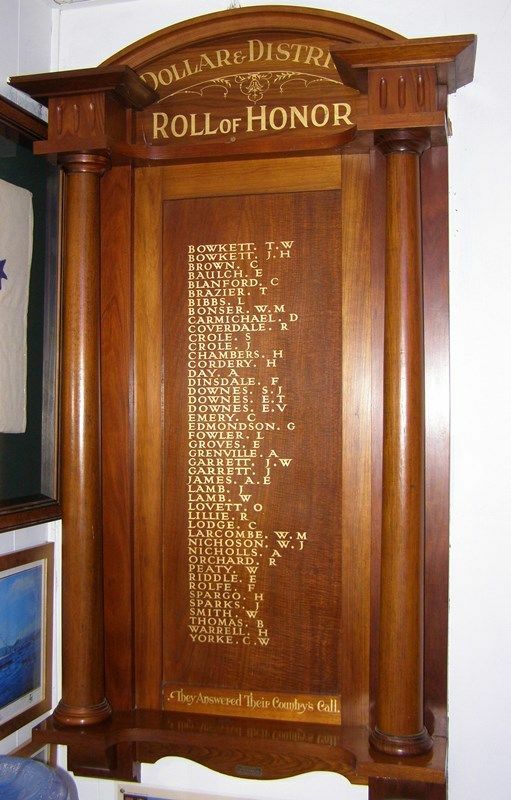 The Board, which was made of blackwood (polished) with fiddleback panel and bearing the names of brave soldiers, was of a unique design and does credit to the people of Dollar and district whose efforts in raising £10-15/6 (the cost of the board), has placed in their institute a long lasting momento in appreciation of the services rendered by their own district lads. They Answered Their Country's Call.